Rich Synowiec: Ran out of time at the CDTC... but this happened! I started with some awesome aspirations to write a blog entry every day but by day three it became too much work to add to what I had to do already. I actually had to blog as part of a marketing contest we were doing so I didn't want to let my group down by doing this one. More to come but the simple truth of the matter is that I passed the program. 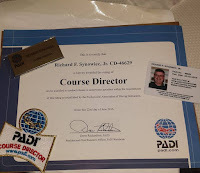 I am a PADI Course Director!